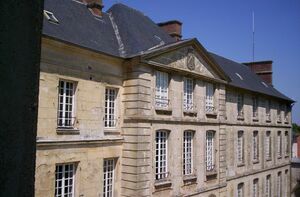 The Centre national de formation des Scouts et Guides de France (National Training Centre for Scouts and Guides of France) is located in the castle if Jambville in France. Each year, more than 2 000 people are formed. With 27 meeting rooms, 200 beds in rooms or dormitories and a dining hall with 400 seats, the center has the necessary infrastructure to accommodate many people. The garden of the castle, built in the XIII century, covers nearly 52 hectares, half in meadow, half in the forest. Every two years, it hosts the meeting of the young christians of Île-de-France, the FRAT. The castle of Jambville is buy in 1952 by the organization "Scouts de France" after the new owners of castle of Chamarande, the previous training center, decided to not ever lend the castle to the scouts. Every two years (odd years), the castle hosts the FRAT (12 000 young people). In 1952, national days of Scouts de France. In 1983, national days of Scouts de France where the Scouts de France's charter. In 1975, the first national jamboree of Guides de France (Pari 75). In 1975, the first national jamboree of Scouts de France (Today, we build tomorrow). In 1989, national camp of French Scouting for the preparation of World Scout Conference in 1990. In 1991, national jamboree of Scouts de France (Land of adventure). In 1997, national jamboree of Scouts de France (Choose your life). In 2006, the fisrt national meeting of Scouts et Guides de France (Words of freedom, Words of future). In 2006, the first national jamboree of Scouts et Guides de France (What talent!). In 2011, national meeting of Scouts et Guides de France. In 2012, national jamboree of Scouts et Guides de France (Live your dreams). This page was last edited on 5 May 2012, at 20:38.